Melanoma is the deadliest form of skin cancer. It occurs when pigment-making cells in the skin, called melanocytes, begin to reproduce uncontrollably. Melanoma can form from an existing mole or develop on unblemished skin. The most common type of melanoma spreads on the skin's surface. It is called superficial spreading melanoma. It may stay on the surface or grow down into deeper tissues. Other types of melanoma can start anywhere on or inside the body, including under fingernails or toenails and inside the eye. 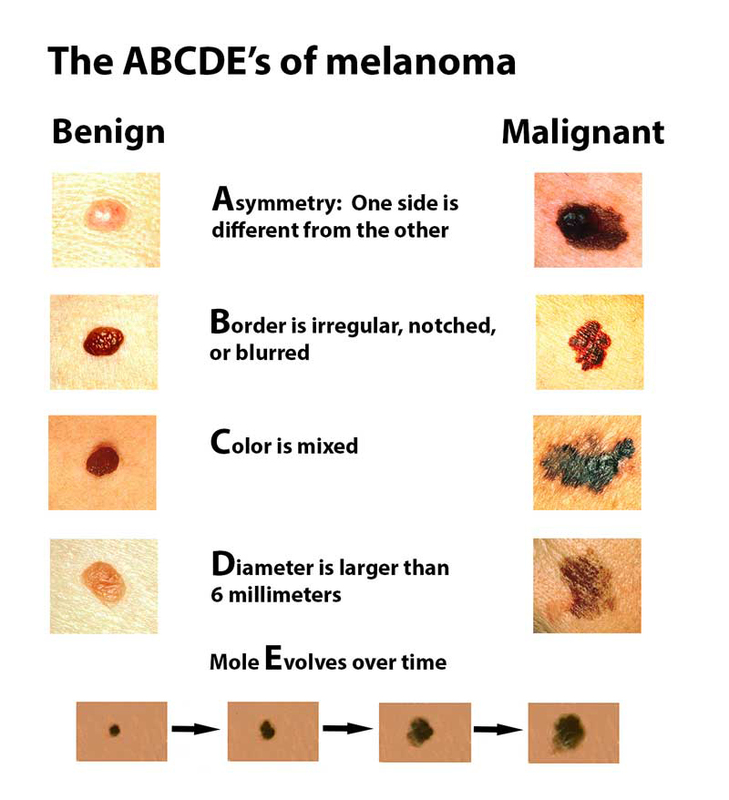 Melanoma rarely occurs before age 18. However, the risk of melanoma rises rapidly in young adulthood, making it one of the most common life-threatening forms of cancer in people between the ages of 20 and 50. After age 50, the risk of melanoma rises more slowly with advancing age. Malignant melanoma is far more common now than it was 100 years ago. In the United States, more than 75,000 people are diagnosed with melanoma each year (slightly more men than women) and nearly 10,000 die of it. About 1 of 50 people develop melanoma in their lifetimes, most likely because of increased sun exposure in childhood. Melanoma is usually larger than ¼ inch in diameter (about the size of a pencil eraser) but can be smaller. The most common sites are the face (especially in older people), upper trunk (especially in men), and legs (especially in women). A mole that bleeds, feels numb, or has a crusty surface may also hint at melanoma. Determining whether a mole or other spot is melanoma usually involves removing a small piece of the mole or spot and the surrounding tissue. This is called a biopsy. The tissue is examined in a laboratory. Information from this analysis can determine if the tissue is cancerous and how deep it has grown below the skin's surface. That's the most important factor in predicting whether it can be cured. If the melanoma is more than 1 millimeter deep, your doctor will want to know if it has spread to nearby lymph nodes. To do this, he or she may inject a radioactive liquid into the tumor. The liquid flows through the natural drainage pathway that connects the tumor to nearby lymph nodes. The drainage path can be tracked. The first lymph node along the path is called the sentinel node. How deeply a melanoma has invaded nearby tissues affects the outlook. If it has invaded only nearby tissue, it can be cured. But if melanoma cells have broken away and traveled through the lymph vessels to nearby lymph nodes and then spread (metastasized) to other organs, the disease can be deadly. To treat melanoma, a doctor must remove the visible tumor along with ½ to 1 inch of healthy skin around the tumor, depending on the size of the tumor. This is important because nearby skin can contain microscopic bits of the cancer. In some cases, the doctor may perform a specialized procedure during which the tumor is shaved away one thin layer at a time. Each layer is examined under the microscope as it is removed. This technique helps the doctor remove as little healthy skin as possible. During surgery, the lymph node closest to the melanoma (the sentinel node) is checked. If it does not contain cancer cells, the other nodes are usually cancer free. If cancer is found in the sentinel node, your doctor may recommend additional treatment. If cancer has spread to one or more lymph nodes, some experts recommend that all lymph nodes in the area be removed, but this is controversial. Although spreading cancer cells might be removed, cells that are fighting the cancer also are removed. It has not been proven that removing lymph nodes makes melanoma patients more likely to survive. cancer that has spread to other organs. Treatment may include chemotherapy, radiation therapy, and/or medicines that boost your immune system's ability to fight the cancer.